20 yrs Experienced DJ with Great Lighting and effects. Former Radio DJ. Available for weddings, Themed events Northern Soul & Motown nights. Any music Genre for your special party. With over 500,000 track we will make your party go with a bang. 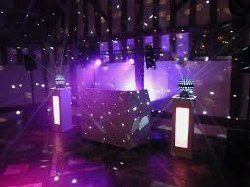 For more info contact us on 07581082734 or 01993 201405. Who wants to pay over the odds for a disco when we have reasonable rates starting at 50 for a childrens party for 2hrs - 200 for your wedding (prices vary on where you your party will be). If you want to sing the Night away we also have a Karaoke if you need one.